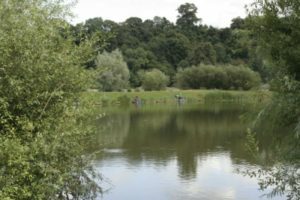 40 anglers fished todays Larford Classic Qualifier on the Specimen Lake. 1st on the day was Mick Bull (Frenzee) who drew peg 18 on the burr. Mick caught on Method weighing 116-04-00. 2nd placed Paul Cook (Frenzee) drew peg 63 landing 115-03-00 on the Method fished long. 3rd on the day was Max G ( PR Floats) who drew peg 20. Max caught on Method & short pole weighing 112-13-00. 4th placed Brian Clark (Vespe) drew peg 70 and caught on Method weighing 110-15-00. 5th on the day was Ian Wood ( Larford) who drew peg 26. Ian caught on the Method long and later down his 6m line with paste to weigh 110-14-00. 6th overall was Phil Briscoe (Larford) who drew peg 8 and caught on bomb & pellet and paste to 6m to weigh 106-14-00. Phil Briscoe & Andy Crocker qualifies for the May 2017 final.